Alphabet Inc.’s (GOOGL) shares dropped over 2% in aftermarket hours on Monday despite the company topping analysts’ estimates on revenue and earnings for the fourth quarter of 2018. Revenues rose 22% year-over-year to $39.2 billion. On a constant currency basis, revenue growth was 23%. 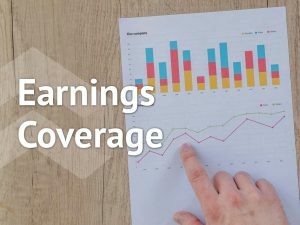 The company reported a net income of $8.9 billion or $12.77 per share during the quarter compared to a net loss of $3.02 billion or $4.35 per share in the prior-year period. Last year’s results were impacted by tax expenses. 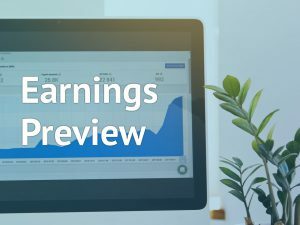 Revenues in the Google segment grew 21% to $39.1 billion during the quarter while Other Bets reported revenue of $154 million, up from $131 million last year. 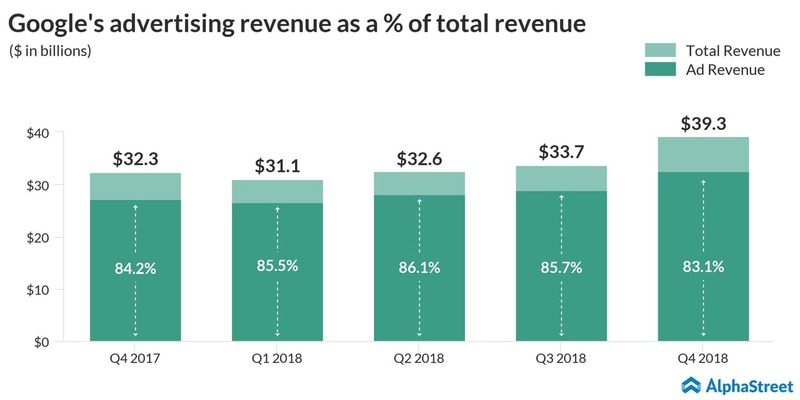 Advertising revenue grew 20% to $32.6 billion from last year while Google’s other revenues, which comprises its cloud business, grew over 30% to $6.4 billion. Total traffic acquisition costs (TAC) grew 15% year-over-year to $7.4 billion. 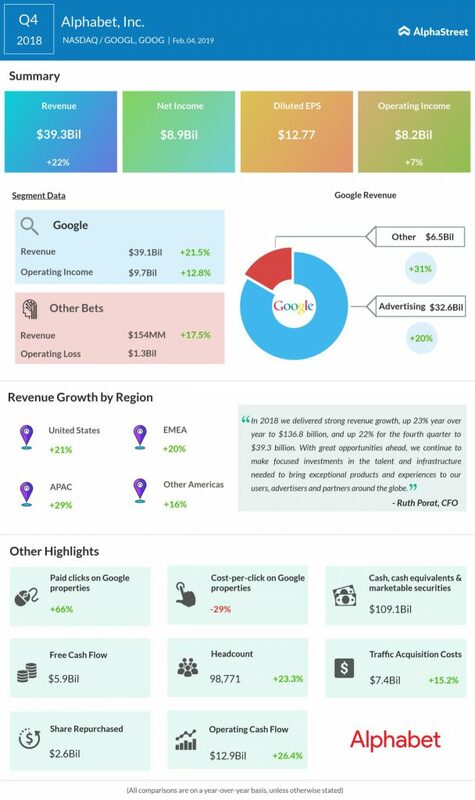 Total TAC, as a percent of Google’s advertising revenues, was 23%. Paid clicks on Google properties grew 66% year-over-year while cost-per-click on Google properties fell 29%. Alphabet’s subsidiary Google has been plagued with several controversies related to user data privacy and security. Recently France slapped a $58 million fine on Google for GDPR violations and the country is said to probing the tech giant’s advertising methods for more clarity in terms of its approach to competition. The Google-parent has been investing heavily in A.I. and machine learning while its cloud segment has been showing healthy improvement. The company is making progress in the automobile segment as well, with its self-driving car unit, Waymo, launching its first autonomous taxi in Arizona. Last month, Google announced the purchase of smartwatch technology worth $40 million from Fossil Group.